After a drug raid killed a middle-aged couple and injured five narcotics officers in Houston last week, the head of the local police union blamed people who criticize cops, while the police chief blamed politicians who fail to support the gun control policies he favors. The real cause was a fundamentally immoral war on drugs that routinely requires violence in response to peaceful activities. Hours after the deadly attack on the home of Dennis Tuttle and Rhogena Nicholas, Joe Gamaldi, the president of the Houston Police Officers Union, condemned "the ones that are out there spreading the rhetoric that police officers are the enemy." He warned that "we're going to be keeping track of all y'all," and "we're gonna make sure that we hold you accountable every time you stir the pot on our police officers." 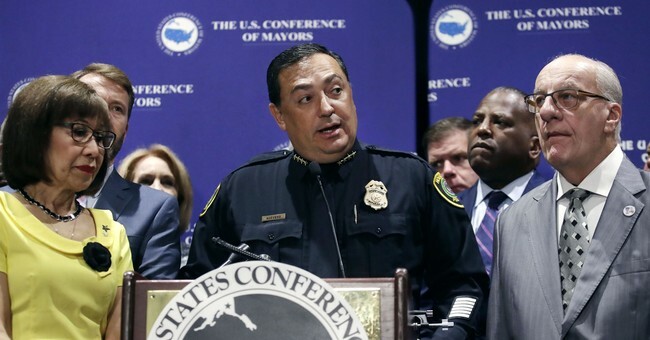 Houston Police Chief Art Acevedo later rebuked Gamaldi for his "over-the-top" remarks. "Joe Gamaldi's emotions got the best of him," Acevedo said. "This had nothing to do with any of the stuff that he was talking about." Yet Acevedo could not resist tossing out his own red herring by criticizing "elected officials" who fail to address the "proliferation of firearms in the hands of people that have no business having guns." The Washington Post praised Acevedo for seizing on the horribly botched drug raid to reiterate his support for "sensible gun safety policies" such as "reinstatement of the assault weapons ban," "a ban on high-capacity magazines" and requiring that "unlicensed private dealers do background checks at gun shows." All of those policies were plainly irrelevant to the incident that supposedly illustrated the need for them. Neither Tuttle nor Nicholas had a criminal record that would have disqualified them from buying firearms, and the revolver that Tuttle reportedly fired at the police officers who invaded his home was not an "assault weapon." Nor was it capable of accepting a "high-capacity magazine." The actual circumstances of the shootout at 7815 Harding Street point to a different culprit. Based on an anonymous tip and the word of a confidential informant who claimed to have bought heroin from Tuttle, undercover narcotics officers obtained a "no-knock" search warrant that authorized them to break into the house without warning, which they did around 5 p.m. on Jan. 28. The first officer through the door was carrying a shotgun, which he apparently immediately used to kill one of the couple's dogs. According to the official police account, which we have to rely on because there is no body camera video of the raid, Tuttle responded by shooting the officer, who collapsed on a sofa in the living room. As Nicholas moved to disarm the intruder, Acevedo says, his fellow officers shot her. Tuttle returned fire, and he was also killed. Although press coverage of the raid generally portrayed the injured police officers as the victims, that surely is not the way it looked to Tuttle and Nicholas. Amid the noise and chaos, it is plausible that Tuttle did not even realize that the armed men knocking down his door, killing his dog and shooting his wife were police officers. They were not wearing uniforms, and in any case, Houston had recently seen a series of home invasions by robbers masquerading as cops. Nor is it clear that Tuttle and Nicholas, who had lived in the house for more than two decades, were actually selling drugs. Police did not find any of the heroin that their confidential informant claimed to have seen in the house the day before, and neighbors, who described Tuttle and Nicholas as "wonderful people" who "never bothered anyone," said they had not noticed any suspicious activity. Even if the neighbors were wrong and the police were right, the so-called crime they were investigating, which involved nothing more than the voluntary exchange of drugs for money, cannot possibly justify the armed assault they mounted. If police officers don't want to be portrayed as the enemy, they should stop acting like the enemy.